The Leelanau Conservancy is proud to have 10 of its most spectacular natural areas included in a newly released guidebook that showcases the best places to hike along or just off of M-22. The book ($22, includes tax) is available at the Leelanau Conservancy office or may be purchased online (add $5 for shipping.) You may also call 231-256-9665. M-22, the 116-mile state highway that wraps around Michigan’s little pinky like a glove, is often touted as Michigan’s most scenic drive. The Leelanau Conservancy natural areas occupy 47 pages of the 192-page book and includes fantastic maps, Ken Scott photographs, trail descriptions, highlights and amenities about each Leelanau Conservancy Natural Area featured. The book makes for a great companion to take along on a hike as well as to discover new places to visit. It gives hikers detailed descriptions of each trail, what to look for, mile-marker and trail difficulty information. 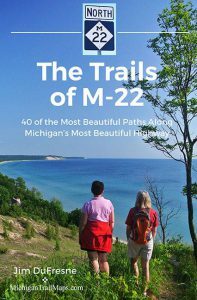 The book also features 30 other trails from the Sleeping Bear Dunes National Lakeshore and Grand Traverse Regional Land Conservancy properties.